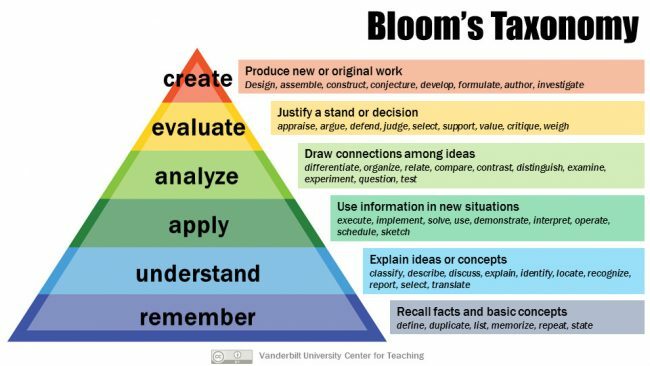 A superficial reading of Bloom’s Taxonomy suggests that knowledge of factual material and basic concepts is a so-called ‘lower-order’ thinking skill. Proponents of skills-based teaching advocate more of a focus on ‘higher-order’ thinking skills, and teachers everywhere are often urged to plan lessons that take students beyond learning and recall of facts. In so many lessons, however, students’ knowledge of factual information is essential to learning, and there has recently been something of a resurgence of the notion of a curriculum based on knowledge. There is a danger that the terms ‘knowledge-based curriculum’ and ‘knowledge-rich curriculum’ become clichés associated uncritically with educational traditionalists or political conservatives, so rather than drop the term vaguely, I shall attempt to define it, before moving on to consider why I think a ‘knowledge-rich’ curriculum is so important for all students, and especially for the disadvantaged. Finally, I want to consider how we might design such a curriculum, and how we make curriculum decisions that are ‘knowledge-based’. N.B. ‘Curriculum’ and ‘syllabus’ are here used interchangeably. For consistency, I tend to use the word curriculum. How do we define the knowledge-rich curriculum? To give students access to knowledge that is ‘powerful’ (more on ‘powerful knowledge’below). The principle underlying the knowledge-rich curriculum is that we are all empowered by knowledge, and that some knowledge is inherently worth knowing because it is more powerful than other knowledge. Since acquiring ‘powerful’ knowledge is so important, it cannot be left to chance, and schools must take responsibility for delivering it to all students. To foster well-rounded and grounded young people. A curriculum that is rich in ‘powerful’ knowledge will encourage the development of strong communication skills by virtue of the knowledge, vocabulary and disciplinary principles conveyed through study of the sciences, social studies, and arts. Creativity and numerous other character traits will emerge through exposure to a knowledge-rich curriculum. The traditions of different subjects—the grammar of individual subjects—are respected. School subjects claim their authority by virtue of their connection with subject disciplines outside the school. These disciplines are the best ways yet discovered for organising human knowledge, and they are the engines for producing new knowledge. School subjects interpret and give access to disciplinary knowledge for school students. Skills and understanding of content—knowledge how—are regarded as forms of knowledge, rather than as transferable competencies that exist outside of specific knowledge domains. Specification of content: topic by topic, the content students will learn will be specified clearly. The knowledge-rich curriculum contains more than topic headings, but includes specific content to be learned. The aim is for the curriculum to outline with absolute clarity the specific body of declarative and procedural knowledge that teachers expect their students to learn. Rigour and coherence: teachers plan their teaching in order to start with basic introductions and build towards deeper understanding, and therefore students’ understanding is built systematically and coherently, allowing for rigorous teaching of complex topics. Teachers can anticipate and address common or likely misconceptions before they arise. They understand the instructional methods best suited to developing novices’ understanding in their subject domains. A knowledge-rich curriculum is delivered with the lessons of cognitive science in mind. Since remembering the key information is such a crucial plank of the knowledge-rich curriculum, the research on memory, forgetting and the power of retrieval practice are vital pedagogical resources. Spaced retrieval practice, low-stakes quizzing and repeated opportunities for deliberate practice help to develop automaticity and fluency. Your learning outcomes are ultimately determined by an external examining body, and you therefore aren’t always in a position to be able to plan your courses the way you would like. You still use resources purchased years ago, for different courses. Your courses have undergone gradual change—some forced by necessity and some by design—and are now substantially different from the way when they were planned. Your colleagues work the way they do because of habit rather than deliberate design, and changing practices is prohibitively difficult. Your own habits also can prove difficult to alter. You have not had the time to review and re-plan your programmes of study. Time pressure—to cover the course in the time available, to allocate time for internal assessments, to compensate for time lost to disruptions—means that teaching decisions are not always made with the knowledge-rich curriculum in mind. In real schools, teaching for syllabus often coverage takes priority over teaching for schema-building. Why is the Knowledge-Rich Curriculum so Important? Knowledge that is ‘better’—epistemically, morally, or aesthetically—than other kinds of knowledge. Powerful knowledge is selected on the basis of criteria about ‘what is true, what is beautiful and how we should treat our fellow human beings and the non-human world that are more universal than others’ (2013: 231). Knowledge that is specialised, since better ways of knowing are associated with specialisation (2013: 231). Specialised knowledge does not have a higher cultural value than non-specialised knowledge, since both kinds of knowledge are essential for understanding different aspects of the world, but powerful knowledge is distinct from opinions and everyday experiences (2013: 230). Knowledge that is produced by, investigated, evaluated and interrogated in specialist institutions like universities and research institutes (2013: 231). If you accept that there is such thing as ‘better knowledge’, then the principle of social justice demands that all young people should have the same access to it. Think about how knowledge changes students: how does the acquisition of knowledge help a student? In History, improved knowledge nuances students’ understanding, enabling them to express their ideas with greater accuracy, elegance and conciseness (Counsell 2018). What is it that forms the basis of such students’ nuanced understanding? These students have developed extensive and secure schemata of knowledge, from studying various overlapping topics. A schema is a mental model or pattern of thought that categorises and provides a framework for knowledge. Schemata influence learning, since new information can be easily absorbed into existing schemata. Schemata are comprised of pieces of information and the connections between them. Simon and Chase (1973) suggest that when an expert chess player examines the board, they either encounter a known pattern, or they add an unfamiliar pattern—or chunk (a mental image of the positions of several pieces)—to their memory. In the decade it takes to become an expert, a chess player learns up to 50,000 ‘chunks’ of information. Skill in chess is the development of schemata, comprising thousands of positions. Of course, as more chunks of information are committed to memory, more links become possible. So a chess player with only 11 chunks of information committed to long-term memory can only possibly make 55 links, while a player with 50,000 chunks can make almost 65 million connections. Likewise, a student with a limited schema can make only simple connections and will probably need to resort to generic, formulaic and superficial responses to questions, while the student with a sufficiently developed schema can activate a much larger network of knowledge and will therefore likely produce more sophisticated answers. If learning means adding knowledge to existing schemata, or creating new schemata, the aim of the knowledge-rich curriculum should be to help students to build broad, complex and interacting schemata across a range of different subject disciplines. We may not go as far as E.D. Hirsch, who argues that there is a body of knowledge that all students must have, but certainly all students must have a sufficiently large body of knowledge to be able to function in the world beyond school. What about students living in homes where abstract academic vocabulary is not the usual language of the dinner table, or (for whatever reason) where there is no conversation over dinner? The knowledge-rich curriculum has the interests of these students at its heart. For those students from socio-economically disadvantaged backgrounds, the knowledge-rich-curriculum school offers the only opportunity to access the knowledge that children from privileged households take for granted. How Should we Design a Knowledge-Rich Curriculum? Core content—the proxy for the whole, the ‘lasting frameworks’ (Counsell 2017: 82), the content that must be committed to long-term memory and must stay with the student. Hinterland content—the whole, the experience of studying topics in breadth and depth, which is important for learning, but all of which isn’t essential for long-term memory. This content may not all be recalled in detail, but it leaves a ‘residue’ (Counsell 2017: 83), a sense of familiarity that can be picked up again in later learning. Counsell uses the example of studying literature, and suggests that reading the whole novel is the hinterland, while the plot summaries, character notes and examples of stylistic devices constitutes the core. To bypass the hinterland would be to diminish students’ learning, but to suggest that students commit the whole novel to long-term memory would be equally poor practice. The knowledge-rich curriculum is carefully planned to ensure that the knowledge introduced progresses from less to more complex. Ben Newmark (2018) talks about the need to plan a curriculum by ‘going down to very, very granular detail and knowing not just what pupils are learning but why, and how this will be built upon later. It means scrolling back and forth between years 7 and 8 and deciding when exactlyis the right point to introduce them to the concept of ‘revolution’ or ‘franchise’. Skills are understood as a form of knowledge, and learning or ‘knowing how’ is an important part of the knowledge-rich curriculum. This will take different forms in different subjects, and must be built into the planning of the courses. What similarities they find between the two topics. What they learned from the mini-unit that was not revealed by the major study. Why they think we chose to study the main unit, and not an alternative. Bernstein, Basil B. Pedagogy, Symbolic Control, and Identity: Theory, Research, Critique. Rowman & Littlefield, 2000. Counsell, Christine. “History.” In What Should Schools Teach? : Disciplines, Subjects, and the Pursuit of Truth, edited by Alex Standish and Alka Sehgal Cuthbert, 73–87. London: UCL IOE Press, 2017. ———. “Senior Curriculum Leadership 1: The Indirect Manifestation of Knowledge: (A) Curriculum as Narrative.” the dignity of the thing, July 4, 2018. https://thedignityofthethingblog.wordpress.com/. davidjhibbert88. “Connecting a Curriculum: Threads and Echoes.” An Act of Communication(blog), June 14, 2018. https://anactofcommunication.wordpress.com/2018/06/14/connecting-a-curriculum-threads-and-echoes/. Fordham, Michael. “Are There Things That All Children Need to Know?” Clio et Cetera(blog), November 27, 2016. https://clioetcetera.com/2016/11/27/are-there-things-that-all-children-need-to-know/. ———. “Can a Curriculum Ever Be Balanced?” Clio et Cetera(blog), March 27, 2017. https://clioetcetera.com/2017/03/27/can-a-curriculum-ever-be-balanced/. ———. “Deepening Knowledge through Vocabulary Learning.” Impact.Chartered.College(blog). Accessed June 11, 2018. https://impact.chartered.college/article/beck-deepening-knowledge-through-vocabulary-learning/. ———. “Have You Taught It? The Problem of the List Curriculum.” Clio et Cetera(blog), February 20, 2017. https://clioetcetera.com/2017/02/20/have-you-taught-it-the-problem-of-the-list-curriculum/. ———. “On Teaching the Canon.” Clio et Cetera(blog), August 20, 2013. https://clioetcetera.com/2013/08/20/on-teaching-the-canon/. ———. “The Importance of a ‘Content Repertoire.’” Clio et Cetera(blog), April 4, 2016. https://clioetcetera.com/2016/04/04/the-importance-of-a-content-repertoire/. ———. “The Knowledge Party in My Head.” Clio et Cetera(blog), November 21, 2016. https://clioetcetera.com/2016/11/21/the-knowledge-party-in-my-head/. Hirsch, E. D. Cultural Literacy: What Every American Needs to Know. 1st Vintage Books ed edition. New York: Vintage, 1988. ———. Why Knowledge Matters: Rescuing Our Children from Failed Educational Theories. Cambridge, Massachusetts: Harvard Education Press, 2016. Newmark, Ben. “Planning a Knowledge Curriculum.” Bennewmark(blog), April 10, 2018. https://bennewmark.wordpress.com/2018/04/10/planning-a-knowledge-curriculum/. Sherrington, Tom. “What Is a Knowledge-Rich Curriculum? Principle and Practice.” Teacherhead(blog), June 6, 2018. https://teacherhead.com/2018/06/06/what-is-a-knowledge-rich-curriculum-principle-and-practice/. Willingham, Daniel T. Why Don’t Students Like School? : A Cognitive Scientist Answers Questions About How the Mind Works and What It Means for the Classroom. San Francisco, CA: Jossey-Bass, 2009. Young, Michael, and Johan Muller. “On the Powers of Powerful Knowledge.” Review of Education1, no. 3 (2013): 229–50. https://doi.org/10.1002/rev3.3017.